Cool, refreshing and fruity, peach gelato is a decadent treat that can enliven any dessert table. Serve this fruity confection on the next warm day to bring the sunny taste of peaches alive and introduce your taste buds to the rich and intense experience of gelato. Gelato is an Italian frozen dairy dessert with a low butterfat content and dense texture. The result of these characteristics is an intense taste of flavor. Fruits such as peaches are pureed and added directly to the milk base. The result is a cross between a sorbet and an ice cream with heavy emphasis placed on the flavor of the fruit, with the dense texture of the cream making for a velvety texture. Peach gelato - made from whole, ripe peaches, milk, eggs and sugar - has an intense peach flavor with a refreshing finish reminiscent of frozen custard. There are many ways to make peach gelato. Some recipes call for heavier cream, while others attempt to enhance the flavor of the peaches with peach liqueur. One thing each recipe has in common is the need to use fresh peaches as the base. Place the peaches in a food processor and pulse until nearly puréed. Allow some small chunks of peaches to remain. Heat the milk in a saucepan just until simmering. Add the sugar and stir until dissolved. Place the egg yolks in a bowl and pour 1/4 of the milk mixture into them. Whisk until thoroughly combined. Transfer the egg and milk mixture back to the saucepan. Whisk well to combine. Increase to medium heat and stir the milk mixture constantly until it begins to thicken slightly and coats the back of the spoon. Remove the pan from the stove and place in a large pan filled with ice water for two minutes. Remove the pan from the ice water and stir in the peaches and cream. Mix well. Transfer the milk mixture to an ice cream maker and follow the manufacturer's instructions. Serve the gelato alongside fresh berries and exotic fruit. Make Belgian waffles and top with a scoop of fresh gelato. Serve with sliced peaches on the side. Crumble biscotti into small pieces and sprinkle over the top of a scoop of peach gelato. Whip fresh cream to top your gelato. Drizzle with peach liquor. Make fresh pizzelle, Italian waffle cookies, and break them into halves or quarters. Insert the pizzelle pieces into the gelato before serving. 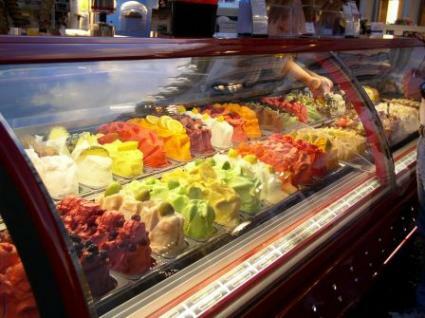 Gelato may freeze too hard in a standard freezer. Therefore, to enjoy your gelato properly, always remove it from the freezer at least half an hour before you plan on serving. This will allow the dessert to soften to its proper consistency and allow the flavors time to truly come alive on the tongue. Serve some peach gelato at your next summer get together and watch your guests marvel at the astounding flavor of peaches and cream that only true gelato can bring to the table.